TS Minority Study Circle Free Coaching Programme 2016 for SI, Police Constable Exams, Free coaching for minorities: TSMSC/Telangana Minorities Study Circle Free Coaching Admission Programme 2016 for Sub Inspector and Police Constable Mains, Online Application form, Last Date for apply, Exam Date, Selection list/results, Free Coaching For SI -Constable Mains Online Registration Form for Admissions, Admission Guidelines details are provided here. Telangana state minorities study circle has given free coaching admission notification 2016 for SI and Constable Mains exam and TS Minority Study Circle is inviting the online application forms the SI and Constable Preliminary Exams qualified candidates for giving free coaching. 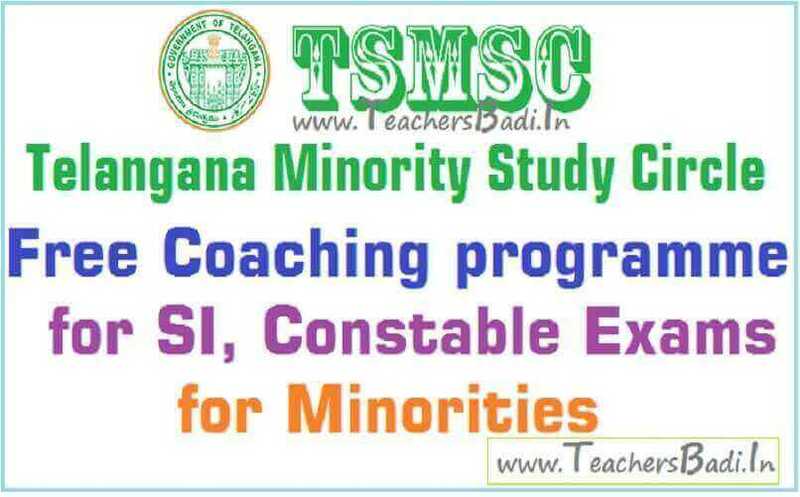 So, the Minority Study Circle is offering free coaching to all minority candidates who have qualified in the preliminary exams for Sub Inspector and Police Constable posts, which were held recently by the TSL Police recruitment board(TSLBRB) in the Telangana State. Facilities: For non-local candidates the government will provide Rs. 1500 towards boarding and lodging in addition to the Rs.1100 which will be given to all selected students for study material and books. 1. All the minority candidates who have applied online for SI and PC Posts and who have successfully qualified in the Preliminary tests are eligible to apply for the Free coaching for SI and Constable exams. 2. Candidate shall have the educational qualification which is eligible for appearing Concerned jobs. 3. The candidate’s family income shall not exceed in urban area 2 lakhs and in rural area 1.5 lakhs. 4. The selected candidate have to deposit their original certificates i.e. T.C., Memos, Caste and Income Certificates in the Study Circle. 5. The seats are allocated to the candidates of different categories i.e. Muslims, Christians, Sikhs, Jains, Buddhist and Parsians as per norms in vogue. 6. Reservations for woman and Physically Handicapped candidates are as per the Reservation quota of Government of Telangana. The minorities welfare department will hold a test and select candidates for free coaching, based on merit. So, the selection process of the candidates is based on either on Merit or Marks Obtained in the Screening Test conducted by study circle. The selected candidates will be given free coaching from 10-06-2016. 3. Last date for Submission of Online Application Form: 06-05-2016(tentative--contact..